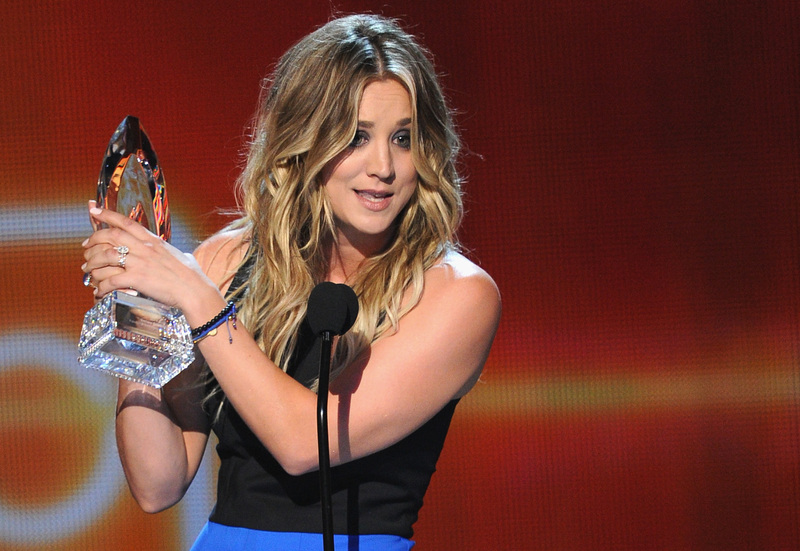 Over the past week, Kaley Cuoco-Sweeting has given me more than a few premature grey hairs. First, Cuoco-Sweeting said that doesn't consider herself a feminist during a Redbook interview because she's "never really faced inequality." Cuoco-Sweeting, that's like saying you don't believe in poverty because you have plenty of money. It's just not a valid argument. And then, when her comments were inevitably met with all kinds of criticism, Cuoco-Sweeting attempted to explain her anti-feminist comment away by saying her words got "taken out of context." But wait, it gets worse — and it all begins with when she presented an award with her The Wedding Ringer costars at Wednesday night's People's Choice Awards. First of all, you have to know that a selfie stick was involved, which is basically inexcusable. Second of all, here's what went down: Josh Gad, also known as Olaf the snowman from Frozen, asked Cuoco-Sweeting if she was the right person to present a category filled with female actresses, given that "you're anti-feminist." Cuoco-Sweeting's reply? "I have to. It's part of my apology tour." It wasn't funny; it wasn't tongue-in-cheek; it was just kind of obnoxious. And even worse, dear Olaf was basically an accessory to this "joke" that fell flat. And if that was genuinely meant to serve as a lighthearted apology, it failed. Big time. In fact, now I just feel awkward about it. Cuoco-Sweeting, if you aren't doing anything after the People's Choice Awards, please give me a call. I am happy to spend ten minutes explaining the finer points of feminism to you, and why feminism is indeed very present in your life, whether you recognize when it's at work or not. Then let's try this whole apology thing all over again, okay? The Golden Globes are this Sunday. Start prepping now.